Right in your hands. Wherever you are. Kompostor is an online platform where you can purchase tickets to events (music, sports, culture, any events where access is based on ticket) as QR codes that are delivered to your mobile phone - by mail or Passbook (iOS) / Google Wallet (Android). 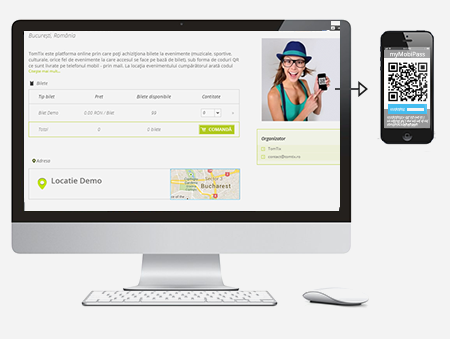 At the place of the event the purchaser shows the code on his/her phone to be scanned and validated by the organizer (using a mobile Kompostor application provided by the event organizers). Without unnecessary travels. Tickets are just one click away from you. At day, at night, outside the office hours, even before arriving at the event, Kompostor is available whenever you need to buy tickets, find the already purchased ones, or find out information about your events. No waiting to receive the tickets. They are sent to you instantly. You will stop worrying that your friends enter the concert with the tickets and they leave you behind. With a simple e-mail forward, you have the ticket with you. Eliminating the cost for printing and distribution, the mobile tickets are cheaper compared to the traditional ones on paperback. You can always find the ticket in your account. You can generate a new one by cancelling the old one (for free), therefore the ticket can't be stolen. You receive reminders for an event and to always have the code at hand. You can set how long before the event you receive these reminders, according to your schedule.